In bottom of slow cooker, layer butter, brown sugar and corn syrup. Cover and cook on High heat setting 30 minutes. Carefully remove slow cooker’s ceramic insert, leaving cover on, and rotate 180 degrees. Continue to cook on High heat setting another 30 minutes or until caramel mixture is bubbling vigorously around edges. Remove cover; turn heat setting to Low. Stir in baking soda and vanilla until well blended; mixture will foam while being stirred. Add popcorn; stir well to coat popcorn, making sure to reach bottom and all around inside of slow cooker. Continue to cook, uncovered, on Low heat setting 1 hour to 1 hour 30 minutes, stirring every 15 to 20 minutes, until popcorn looks dry and caramel is cooked on. Spread on waxed paper. Cool 15 minutes. Stir in pretzel twists and nuts. Store at room temperature in airtight container. Slow cookers vary. Keep an eye on your caramel as it nears the end of cooking time. 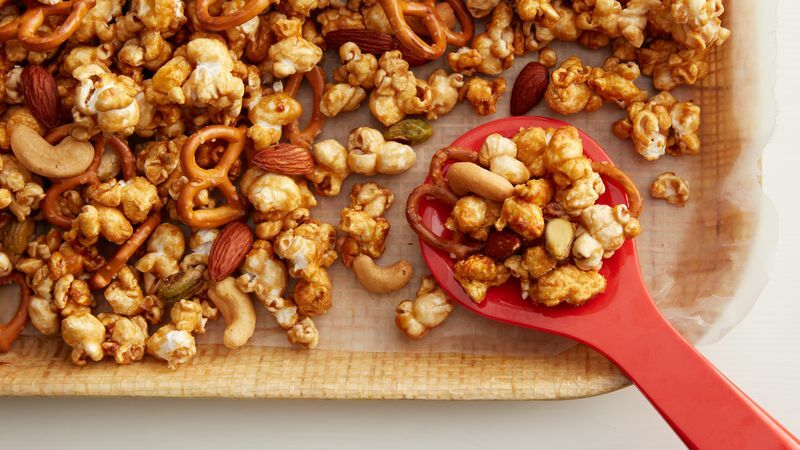 Try your favorite combination of mix-ins to make your own caramel corn with different nuts, M&M’s™ chocolate candies, dried fruit or potato chips.